Blowouts are rare in the big time FSU - UM rivalry. 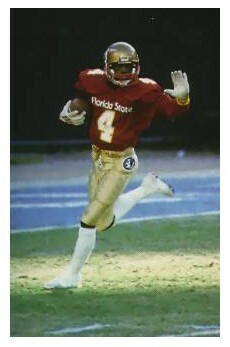 But the Noles notched one in 1984 against the reigning National Champs (Miami's first after beating Nebraska). The final was 38 - 3 and the win was sealed on the third play of the second half when Jessie Hester took a pitchout 77 yards. The fact this clip is from the Hurricane network seems to make Hester's gamebreaking run even sweeter.